If you’re looking for proper car storage and thinking about purchasing a universal fit, cheap car cover, you should consider your options before doing so. The types of car covers that have a ‘too good to be true’ price, generally are just that. Cheap car storage options like an off the shelf cover might seem like a good idea at the time. However, in hindsight, you may think very, very differently. Why Should You Buy Car Covers? What’s The Cost of Going Custom? Does The Brand of Car Cover Matter? How Do You Pick The Right Car Cover for Proper Storage? By the end of this article, you will be a car cover connaisseur! There may be some of you who are still on the fence about purchasing car covers and that’s okay. So, before even getting into what you can expect from cheap car covers and other more custom options, there’s the business of why people should buy car covers in the first place. It all comes down to protection when your car is being stored indoors or outdoors. There’s tons of potential for exterior body damage when your car is parked outside. However, there’s a comparable amount of hazards that can cause damage when your car is parked "safely" in your garage. It may not be as safe from damage as you think. Terrible weather, terrible drivers, and terrible walkers (they are out there) can all have a hand in exterior body damage when your car is stored outside. 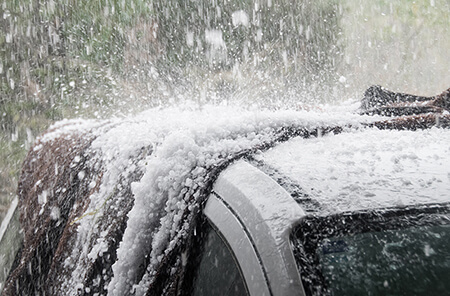 Unfortunately, sometimes you don’t have a choice and have to park your car where it is susceptible to damage from weather, like the sun, heavy rain, hail, and snow. This is where a car cover proves itself worthy, protecting your automobile from these damaging conditions. Additionally, your car will remain protected from dents, scratches, and dings. Air pollutants can also cause degradation to your car’s exterior when left outside for long periods of time. By having the right car cover on your vehicle -- depending on your needs -- will ensure that your car is protected from many of these outdoor conditions. It might not be your first thought when thinking of car storage, but storing your car properly indoors is also extremely important to maintain the integrity of your car’s exterior. While you may not be shielding your car from bad weather, you are protecting it from garage hazards. All it takes is a bicycle or toolbox falling onto your vehicle and you’ve got some pretty hefty damage. Furthermore, when storing your classic car or sports car, there’s nothing worse than if it is completely covered in dust when you decide to take it out for a spin. Proper indoor storage will make sure that your car remains damage, dust, and dirt free, even when stored for many months. 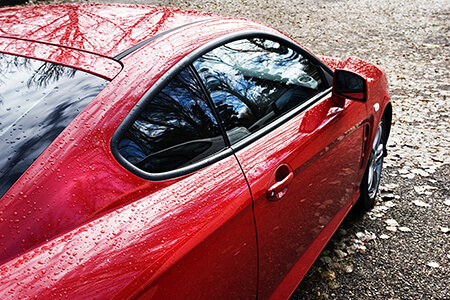 Avoiding exterior damage is the reason why car covers are worth it. If that’s something you’re seeking, then this type of automotive accessory is very useful. 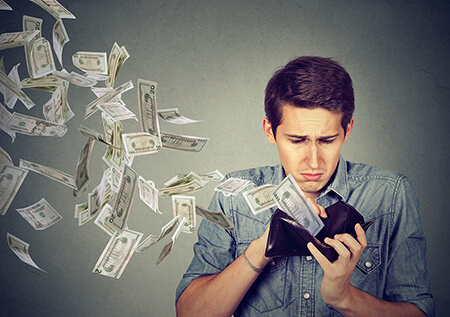 We know money plays a factor in why you purchase (or don’t) purchase automotive accessories like car covers. But, it may surprise you just how much you’ll actually save long term by having a fully protected car. After doing some research, we found that the range for the cost of fixing paint scratches is between $50-$1500 depending on the vehicle, as per the Auto Body Repair Cost Guide from 2017. The price will also greatly depend on how bad the paint damage is. If only a single-stage paint repair is required, it will likely be on the lower range, but not always. For minor dents that are around 1 inch in size (with no paint damage), you’re looking at around $120, adding $10-$30 for every additional half an inch. Angie’s List further explains that this can vary from auto body shop and skill level as well. Unfortunately, the cost of a damaged hood from a decent dent could be much more depending on the car. For example, a hood could be made of aluminum and if the dent is severe enough or there's paint damage, replacement of the hood may be required. The price of a new hood is going to be far more than the cost of a highly protective car cover. It can be hard to swallow the cost of repair bills like this and some may avoid doing it altogether. The issue with avoidance is that things generally get worse and the damage can grow. 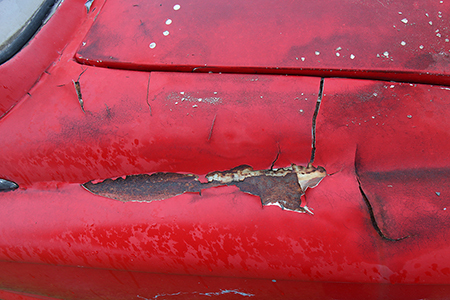 A scratch can grow especially if the car is stored outside and a dent can spread and rust. With all that being said, why should you buy car covers? In the long run, they will save you money. Now that we’ve established the why, we can talk about the what. This is where it can become complicated. A cheap car cover can seem like the most cost-effective solution for car storage, but the lack of quality material or proper fit is something to be aware of. This can end up not protecting your car effectively at all. For some cheaper car covers, quality is questionable. If the quality isn’t there, how can the material stand up to even mild weather conditions, let alone more severe ones? Imagine having your car parked outside during a rainstorm and your cheap car cover is supposed to be water resistant, but due to the lack of quality, is not really that resistant at all. As the heavy rain continues to fall on to your "protected" vehicle, the car cover can only withstand so much liquid before it’s saturated. As such, the water begins to seep through the material to your car. If you aren’t aware that this is happening and your car is parked for a long period of time, the result can be a nasty case of mold or mildew. Worse, if you had any previous scratches or dents, these could now be bigger in size or rusting could be occurring. As mentioned, generally speaking the cheaper you go for most things reflects on overall quality. But when you’re dealing with automotive accessories, like car covers, cheaper also indicates the likelihood of a cheap fit too. What we mean by a cheap fit is a product that does not properly contour to the shape of your vehicle. The universal fitting product is not dimensionally the same in many cases. Of course, there are levels of fit for universal car covers that offer a sizing chart. In these cases, you are most likely not paying that cheapo price. We’ve seen universal car covers go for under $100 that fit okay, but not great. There are others that are even less than $50 for which we suggest serious research before purchasing. This is when you’re going to really see a poor fitting car cover -- unless you’re one of the lucky ones. If the car cover doesn’t fit well, it honestly doesn’t look that great either. Much like a universal fit BBQ cover, it’ll look more like an oversized jacket. With all things considered, how can a cheap, universal fit car cover really protect all of your car? A poor fit means poor protection all around as it may not cover every inch of your car’s body. 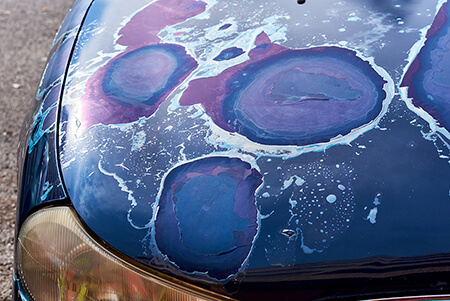 Imagine parking your car in the sun for a long time, with a tiny portion of your car exposed. This is the only part of your car that gets sun exposure. The result could be a very noticeable sunspot. Those are just a few cases where going the cheap route, may leave you with a damaged exterior, making you mad, sad, hurt, and probably feeling a little bit cheated. Now, we’re not saying all universal car covers or cheap ones are low quality. The point we’re making is that if you’re trying to properly protect your vehicle’s exterior, you’re far more likely to get the job done with a quality, custom fit car cover. We will now give you some information about the custom car cover options. When a car cover is custom made that means it is made for your specific vehicle. The exact year, make, and model. So how does a custom car cover beat a universal? Let’s find out. When you pay for a custom highly water resistant car cover, that’s what you’re going to get. While we can’t speak for every automotive accessory company, we can speak to that fact that we ensure all our product descriptions are accurate and reflect the true features of the product. 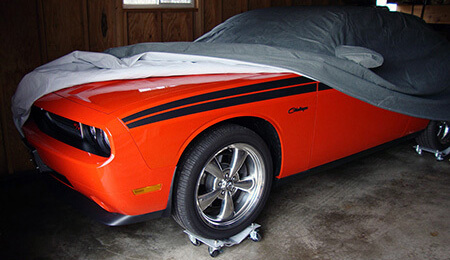 For example, Custom Stormproof™ Indoor & Outdoor Car Covers will protect your vehicle from all weather conditions. That means you will not have to worry about water seeping through the seams of this product. Regardless of what company you purchase from, we always suggest reading through car cover reviews to see what other customers, similar to yourself, are saying about the products in question. That way you hear it first hand if the product is inaccurately described. The idea behind custom car storage like Premium Satin Stretch Car Covers is that they are made to fit the exact size and shape of your vehicle. Instead of a ‘one-size-fits-all’ or a range of sizing options, these will be made to order and tailored to your vehicle sizing and dimensions. These will be “one-size-fits-yours-only” instead. This type of attention to detail and care for quality ensures you’re getting a premium fitted car cover that actually protects your vehicle properly. The custom nature of the product ensures that no corner of your vehicle will be exposed to any outdoor weather conditions, like the sun. Thus, as long as you order a sun proof car cover, like the Silverguard™ Sun Car Covers or Custom Silverguard™ Plus Reflective Car Covers, your car will not incur sun damage when exposed to UV rays -- even when parked outside for long periods of time. There’s no sense in denying the fact that a custom car cover is going to cost a bit more than a universal, cheap one. In all fairness, the products aren’t in the same category of quality or fit for the most part. So, you can’t expect the same price. It is important to remember that you’re paying for a highly protective, custom fit automotive accessory. One decent dent or deep scratch could cost the same as a car cover, if not more. The less severe repairs may not be the same price of a car cover initially however, if your car requires multiple repairs over its lifetime due to storage damage, it adds up quickly. This is where proper research is required. If a brand is reputable, there will be many reviews about the company. You can start by looking at their website and reading what people are saying there. It is also a really good idea to look for external reviews, like Google Reviews. In most cases, you’ll find helpful and insightful information there, making it easier to determine the brand’s reputation and the quality of their products. When browsing a site, make sure to read about the warranty and confirm there is a fitment guarantee on custom made items (car covers or any automotive accessory for that matter). There’s also the benefit of talking to a sales representative from the company in question. Talking to a real person can really help in discovering what a brand is like in terms of customer service and product support. Not everyone feels this is necessary for online shopping. If you’re ever in doubt though, this is always a good idea to ease your mind before ordering. The brand does matter if you’re looking for a premium quality and fitted car cover. Be sure the brand lives up to these standards and you’ll be good to go. How Do I Pick The Right Car Cover for Proper Storage? "Where will my car be stored most often?" "What level of protection do I need in this particular environment?" "Do I need protection for multiple environments, i.e. indoor/outdoor, rain and sun?" "Do I care about color?" After you’ve answered these questions, it will become clear what type of car cover you actually need. While asking yourself questions may seem trivial, nailing down the specifics ensures that you’re getting the right product -- not the wrong one. The last thing you want is to get a product that will not store your car properly -- especially when you’ve paid a bit more for it. It’s Official: You Are Now a Car Cover Connaisseur! Well, here we are. We’ve given you the low down about buying cheap, universal car covers. Additionally, you have the insight into custom car storage options and what this type of automotive product has to offer in terms of quality, fit, and protection. Congrats on becoming a car cover connaisseur and happy shopping! We know you’ll find the right product for your car storage needs.